The efficiency of a cold store depends not only on the type and performance of its refrigeration system, the building properties and climatic conditions, but it is also strongly affected by the cold store functioning in terms of its internal and interface (storage-transport) logistics operations. The way a store is loaded and unloaded, its space organisation and handling systems, food packages’ ordering, air circulation, temperature and humidity control in the cold rooms affect all heat and mass transfer processes taking place inside and around the food packages and loads. As is known, these processes determine the microbiology and biochemistry of spoilage, along with the final product quality and the overall energy and economic efficiency of the store. Cold store dock and dock facilities are the interface between the coldchain logistics systems outside and inside a store. Dock type, organisation and size determine the time of all loading and unloading operations. In order to speed-up truck unloading, there is a vestibule between the storage area and the dock ramp, where incoming load is accepted, inspected, counted, measured, sorted and prepared for processing before storage. The sizes of dock acceptance ramps (if any) should permit simultaneous handling of an adequate number of vehicles. Loading docks ease the handling and transfer of pallets to and from the cold rooms and transport vehicles. For road transport the problem is to determine the height of the dock to match the average vehicle height (between 1.40m for trucks and 60cm for distribution vans). Moreover, when the vehicle is loaded or unloaded its height changes and this is particularly awkward when the forklift truck has to enter it. Levelling facilities adjust the dock to any vehicle height; the dock and truck platform are thus equalised at any time of the loading or unloading operation (Figure 1). Loading docks might be exterior (covered by a roof or simply by a canopy), flush with the building envelope, or fully enclosed in the store building. The choice of open or enclosed docks depends mainly on the climate and the handling system employed5. Cooled dock doors should be equipped with a perimeter cushion seal or protective strips to adjust the rear of the truck to the loading door, thereby reducing cold air leakage. This system is usually provided with a displacement mechanism which, along with the levelling device, facilitates handling, and the maintenance of loading dock temperature (Figure 2). Doors are one of the major sources of heat gain into a cold store, and any improvements to door operation reduce energy use. Doors for cold stores need to be designed and maintained with attention to vapour seals and avoidance of conduction paths (thermal bridges). Significant reduction in heat loads and improvements in energy efficiency are achieved by using airlocks, rapid roll doors and strip curtains12. 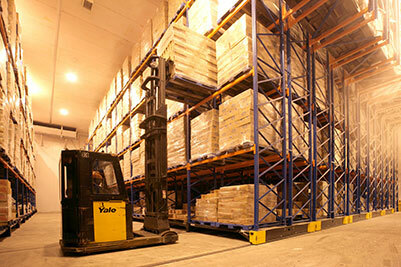 Handling systems in cold stores commonly use palletised unit loads. The most common unit loads are the P10 pallet (100 x 120cm) and the ‘Europallet’ or P8 pallet (80 x 100cm). For rapid and safe handling of palletised stock the load must be secured onto the pallet by stretch-wrapping or shrink-wrapping, when pallets are not stacked one on the other. When pallets are to be block stacked, the secured loads may be held within steel frames or corner posts with strapping; in this form loaded pallets are frequently stacked five high3. As handling systems become more precise, fast, efficient, and automated, the stability and dimensional accuracy of the unit loads and the quality of pallet bases have become increasingly important. Cold stores often have equipment at the intake dock for re-building and re-wrapping unit loads that have shifted in transit, and pallet inverters which permit damaged pallets to be replaced or non-standard units to be re-palletised3. Storage capacity and its distribution depend on several factors: traffic levels, average duration of product storage, nature of the goods, stacking height permitted – for the product itself and for the pallets, etc. Generally speaking, for capacity distribution, it is better to have a small number of large cold rooms, even in multi-purpose cold stores3. Because of continuously increasing capital and running cost of cold stores, the storage density should be as high as possible. Typically, the lowest storage density is found in small cold stores with lower height (up to 7.5m), while the highest storage density is found in large cold stores with higher ceiling (up to 10m). Storage density and space organisation depends on the type of products and on the type of refrigeration they will undergo3. Long-term storage of large quantities of raw materials and semi-finished products intended for further processing requires handling and storage regimes which make maximum use of available storage volume. In this case, the emphasis is put on the storage, so bulk stowing and relatively unsophisticated equipment would be applicable3,6, as illustrated in Figure 313,14. 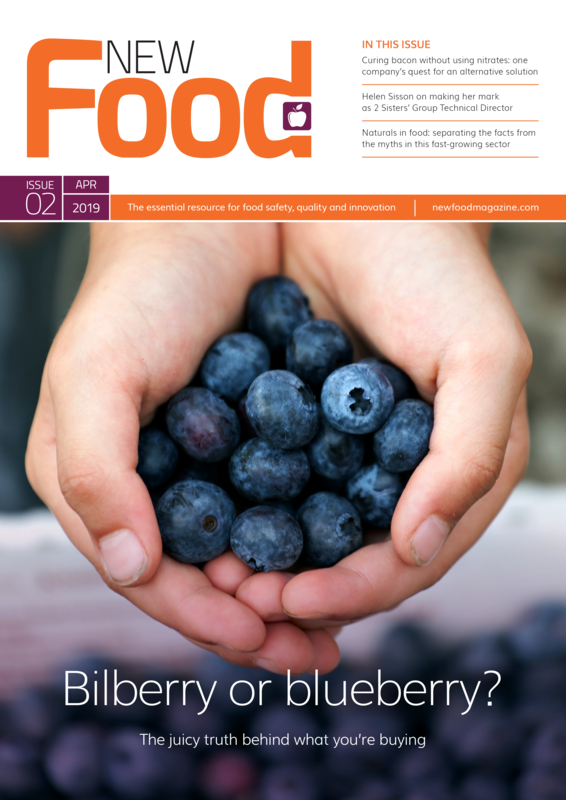 Cold stores should be capable of handling increasing amounts of ‘finished’ goods which require relatively short ‘buffer’ storage, but greater access to the stock. In this case a specially designed handling and storage system is to be applied (Figures 4-9). Chilled edible products seldom require long-term storage in a cold store. Typically they have short shelf life and require close monitoring of temperatures, high hygiene standards and careful surveying of stock turnover3. Adjustable pallet racking: This is the simplest form of racking, which gives access to all pallet spaces. It can also be used ‘two deep’ if the fork-lift trucks are equipped with telescopic forks. This permits better use of storage volume, but more limited access to the loads placed at the back (Figure 4). Mobile racking: This permits high-density storage by moving and ‘closing’ the racks together, thereby leaving aisles for fork-lift trucks only where required (Figure 5). Drive-in racking: A high-density storage system which supports pallets at their edges, thus allowing fork lift trucks to enter the racks in order to place and retrieve loads. This is useful for large intakes and withdrawals but it has very poor access to stock when the cold store is fully loaded. It ensures a ‘last-in-first-out’ operation (Figure 6). Pallet-live system of storage is where pallets roll by gravity in ‘lanes’. If loaded from one end and unloaded from the other, these ensure a ‘first-in-first-out’ operation. The system can also be used in ‘push back’ mode, giving ‘last-in-first-out’ operation. In this mode, it compares well with the drive-in racking, because high levels can be emptied without disturbing lower levels (Figure 7). High-bay cold store: The essential aspect of such equipment is its operating height. The building footprint remains small and the racking is built to the maximum practical height. This is usually determined by the ‘stiffness’ and therefore, by cost and reliability of the cranes which travel in crane aisles to serve all levels. The rigid nature of the racking matrix and crane structures can also permit the insulated envelope to be fixed directly to the racking, without a separate building framework (Figure 8). Active systems: In these high-density systems, pallet movements in all three dimensions are carried out by using a combination of horizontal and vertical transfer carriages. Highly automated, computer controlled and sophisticated, these systems can be extremely flexible in use: in-loading at one level whilst simultaneously out-loading at another and pre-arranging the stock on others for subsequent activities (Figure 9). The movement of unit loads within cold stores may be improved by the use of powered or gravity conveyors. If fork-lift trucks are used on a ‘stay-in’ basis, pallets may be taken in and out of the store on conveyors, thus enabling the smallest door to be used with the shortest opening interval. Automatically guided vehicles (in a wired or wireless way) have the advantage that their paths can cross, while other traffic, people or goods can use the same floor space3, as shown in Figure 1015,16. Measure regularly the air temperature around the stacks and, wherever possible, the food temperature in critical points inside the stacked food packages. In case of unpacked products, check the relative humidity as well. All opened food packages should be stored on clean and sanitised surfaces in the cold storage area. These must be protected against contamination by covering with plastic wrap or foil, or by placing the contents in food grade containers with fitted lids. All items should be properly labelled and dated. As already mentioned, there are several ‘golden rules’ for storing refrigerated products which come to the store from quick chilling or freezing systems at storage temperature and those which are loaded warm above the storage temperature8. The latter is still typical for chilled foods, while frozen commodities almost always undergo refrigerated processing before storage. When the intake product temperature is above the storage temperature, an intensive airflow through the products should be ensured to enhance the convective heat transfer. Packaging design and pallet configuration are critical in this sense (i.e. ventilation holes, plastic wraps and liner should appropriately be employed). Products entering the store at storage temperature need only a moderate airflow around large stacks rather than through the individual food packages (unless foods respire), which intercept heat before it gets to the products. Stacking food in large bulks reduces product temperature fluctuations and weight losses in case of unpackaged produce. This article has been supported through the EU Project ICE-E (Improving Cold Storage Equipment in Europe, No. IEE/09/849/SI2.558301). It widely uses and partially reproduces information from the IIR Cold Store Guide (1993) whose authors are gratefully acknowledged for their outstanding contribution. ASHRAE (2010). ASHRAE Handbook: Refrigeration. IIR (1990). Manual of Refrigerated Storage in the Warmer Developing Countries, International Institute of Refrigeration, Paris. IIR (1993). Cold Store Guide, International Institute of Refrigeration, Paris. WFLO (2001). Successful Refrigerated Warehousing: A guide to the operation and management of refrigerated warehouses and distribution centres. World Food Logistic Organization. Henningsen M. (2003). Maintaining the cold chain, Proceedings of the USDA Seminar “Cold Chain – the Bottom Line”, Sofia, Bulgaria. Stringer M. and Dennis C. (2000). Chilled foods – A Comprehensive Guide, CRC Press, Woodhead Publishing, Cambridge, England. Cleland D.J. (2010). Temperature control and energy efficiency in cold storage. Proceedings of the 1st IIR International Cold Chain Conference, Cambridge, UK. Stiles D. (2014). Aisle-Masters space savers for Yearsley. Global Cold Chain News, 15 June 2014. Kostadin Fikiin is a Research Scientist (Senior Assistant Professor) and International Project Manager leading the Refrigeration Science and Technology Research Group at the Technical University of Sofia in Bulgaria. Kostadin’s research focuses on the heat transfer process and energy efficiency throughout the food cold chain. He is a Member of the Executive Committee of the International Institute of Refrigeration (IIR) and is also the Chairman of the EHEDG Food Refrigeration Working Group. Kostadin has published numerous articles and several book chapters and is a regular speaker at scientific events worldwide. Detelin Markov is a Senior Assistant Professor at the Department of Hydroaerodynamics and Hydraulic Machines at the Technical University of Sofia in Bulgaria and a researcher at the Centre for Research and Design in Human Comfort Energy and Environment (CERDECEN). Detelin’s main areas of experience include fluid flow measurements; experimental and numerical investigation of turbulent flows; heat transfer analysis in solids, liquids and gases; and analysis of energy efficiency of industrial processes involving moist air, water and water vapour. Detelin has published over 100 research papers to date.